MOVEIUS Contemporary Ballet, seeking to push the boundaries of ballet to tackle policy issues affecting society, recently premiered Rite of Spring, Crash of Fall for its commission at The Kennedy Center. 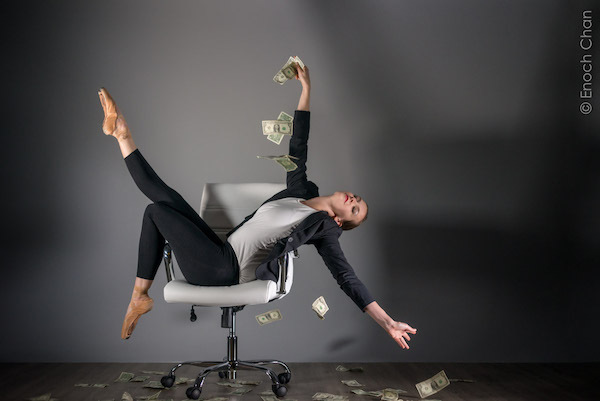 The 35-minute ballet uses Stravinsky’s Rite of Spring score and storyline as the backdrop for revisiting the 2008 financial crisis on its 10-year anniversary. Now the company prepares to present a full-length performance of Rite of Spring, Crash of Fall in winter of 2019 for its home season at Dance Loft on 14, the company’s 8,000 square foot facility in Ward 4. MOVEIUS’ season at Dance Loft on 14 marks a special milestone for the company, as it will be the first time the dance company will have a home season in the space—opened in 2015 by Diana Movius to address the need for affordable rehearsal and performance space in D.C. In addition to Rite of Spring, Crash of Fall, MOVEIUS will also present its acclaimed Glacier: A Climate Change Ballet at Dance Loft on 14. The company recently performed this work at the Global Climate Summit in San Francisco. MOVEIUS’ home season at Dance Loft on 14 was originally scheduled for November but had to be pushed back twice due to health issues with the show's lighting operator. Dance Loft on 14 is located at 4618 14th Street Northwest, Washington, DC. Stay tuned for new performance dates at www.danceloft14.org. Promotional photo for Rite of Spring, Crash of Fall by Enoch Chan, courtesy of MOVEIUS.